What do you want to convey about your medical practice, your services or your team? Whatever your message or the look you want, PracticeSites will help market you on the web with style — without any hassles and without delay. 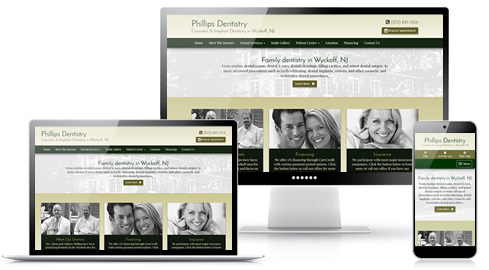 Our tech-savvy professionals combine Internet know-how with solid design sense to create unique, visually compelling websites for each practice we work with. In today's world of instant online information, it's important that your website grabs the viewer's attention and keeps it. PracticeSites has designed and built hundreds of medical practice websites since 2003 and can guide you through the process of choosing and adding relevant content, while keeping your site easy to navigate and aesthetically pleasing. If you have a special promotion, new staff member or any other news to share with readers, PracticeSites will upload your changes for you for free at any time — saving you valuable time and money. Over 30 patient education videos that help boost your case acceptance by explaining medical conditions, their symptoms and their treatments . . . often before that consultation even occurs. The benefits and beautiful end results of cosmetic dentistry are best understood through pictures. You can add before and after shots of your restorative medical work on your website if you would like. Just let your PracticeSites representative know this is a component you'd like to have on your practice's website. Then you simply email your images to us and we'll upload before and after shots of your cosmetic medical work or other medical treatments to your website's Smile Gallery. Give your patients a chance to learn more about upcoming medical procedures or other medical treatments with our library of 30 educational videos. These online animated movies will educate and inform patients, with step-by-step explanations of common medical procedures that give readers access to valuable information about your services any time, any place. And best of all, we offer these videos free for the first year as part of your monthly package; after that, the complete library is only $19 a month and will soon pay for itself by increasing case acceptance. Link our library selection to your medical website and become the go-to dentist in your area, with animated educational videos from PracticeSites. Streamline your appointment process by incorporating Medical Web Service's Appointment Request feature into your website. This simple email form makes it easy for prospective patients to become active patients in a few keystrokes. We make sure no request is overlooked by sending your office personnel an email alerting them that an appointment request has been submitted. Office staff receives the email, checks the requested date and time for openings, and calls the patient to confirm availability or find another appointment time. We're happy to report that more than 50,000 appointment requests have been generated through our clients' websites and the list continues to grow. As an added convenience for patients, why not let them fill out necessary forms at home before their appointment? We can link downloadable forms right onto your site by converting your office documents to PDFs. Patients can fill out the paperwork at their leisure and bring it in when they come for their appointment. Filling out forms ahead of time also helps means patients are more apt to keep their appointments. These valuable statistics will help us work more effectively together to make sure your message is on target . . . and your target audience is responding positively.